Well, the garden is still intact. The new chicks kind of put all that on hold. Additionally, I think something out there read the blog and told everyone to shape up or else! We got more from the garden yesterday than we have for the last month, but it’s still not a lot. The only plant I really want to leave is the basil. I always plant basil and marigolds near my tomatoes to deter horn worms and other nasties. I bought a basil plant this year, and then found the seeds I had saved from two years ago. I planted those just to see what they would do, and they didn’t do bad. 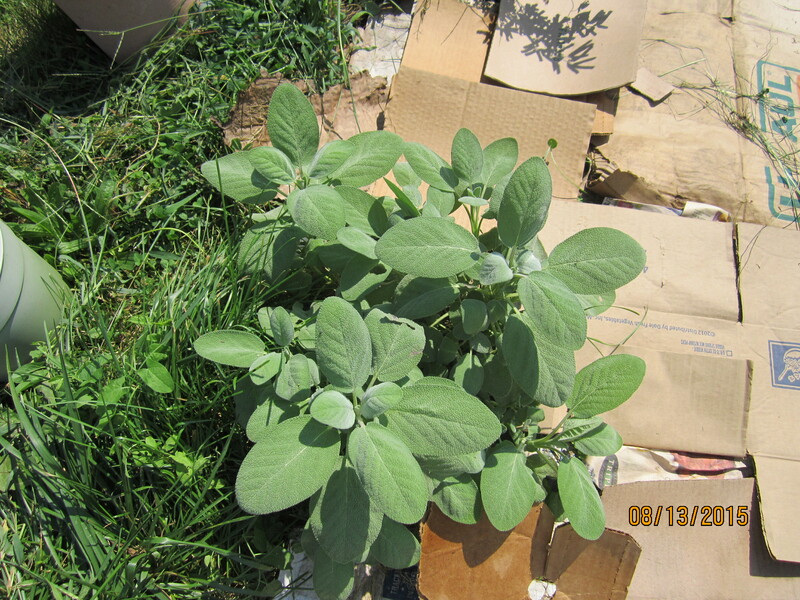 I’m thinking I will harvest the leaves from the plant I bought and then let the other produce some seed that I can save for next year. 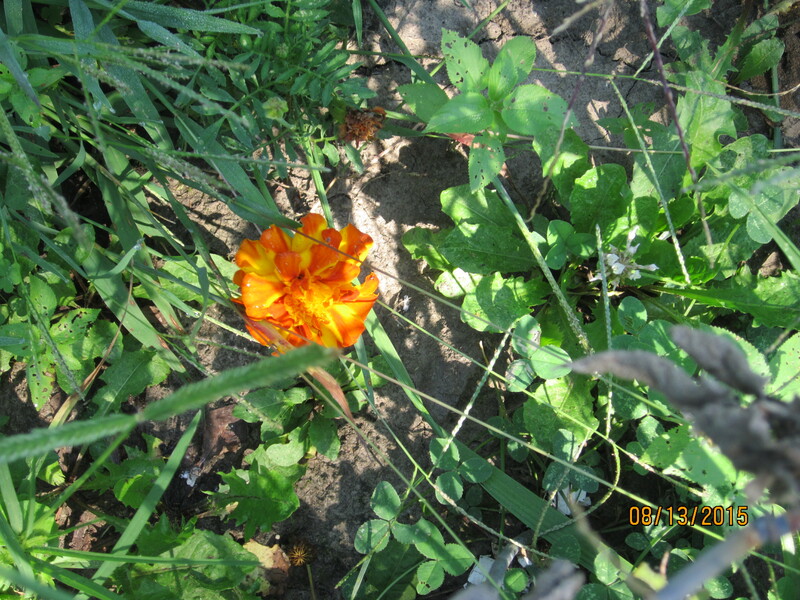 I have one die hard marigold too! The front yard is doing much better. We harvested the three little cabbages that survived from the seeds Kat and I started indoors last winter, and turned them into a nice batch of slaw (whole 30 compliant, of course). 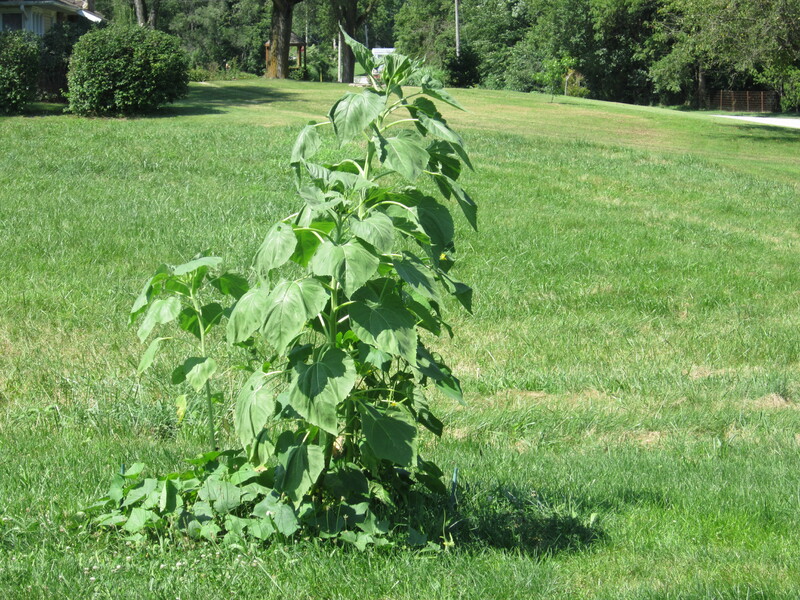 The green beans out there are still steadily producing. I am thinking about leaving them now, and using what else we get for next year’s seed. The strawberries are sending out runners everywhere, and I am looking forward to seeing what we get next spring. 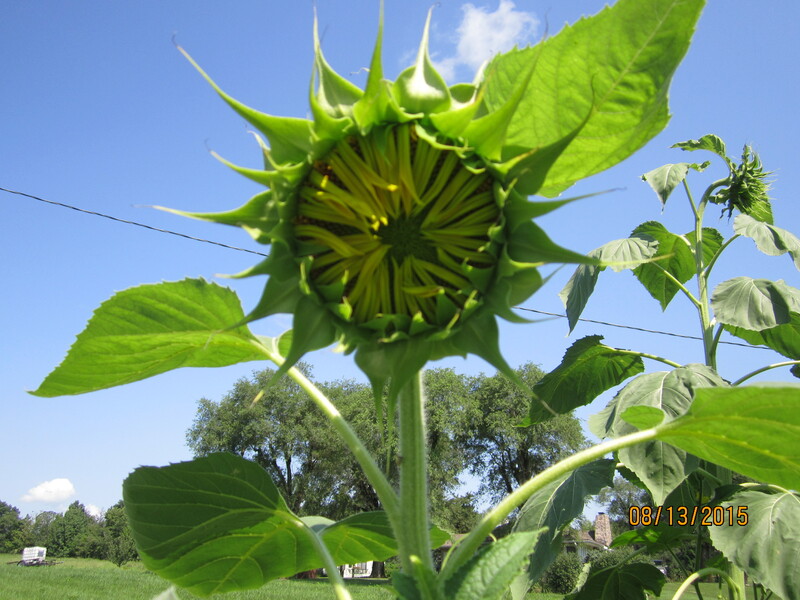 We also have sunflowers growing from saved seeds. They are working nicely as a trellis for our best producing cucumbers. 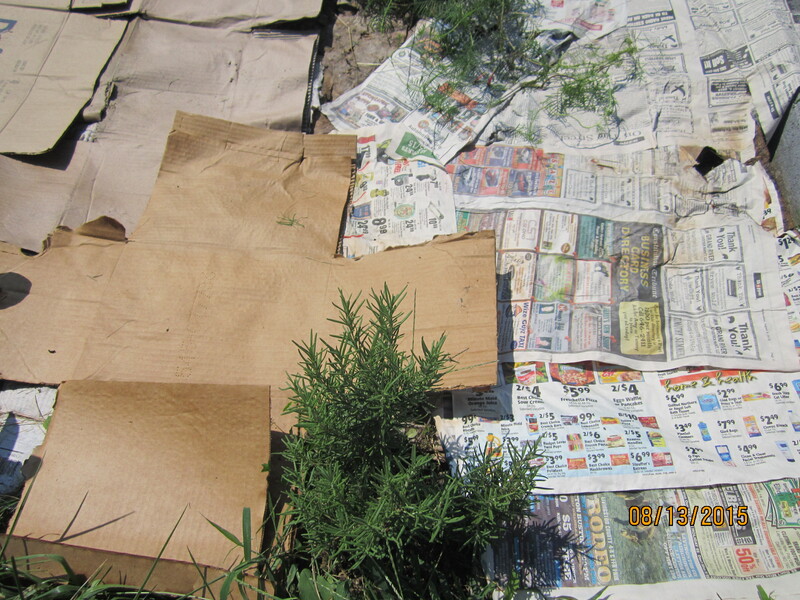 I have been working on covering the strawberry and herb beds with newspaper, cardboard and mulch to cut down on weeds and provide some nourishment to the soil. 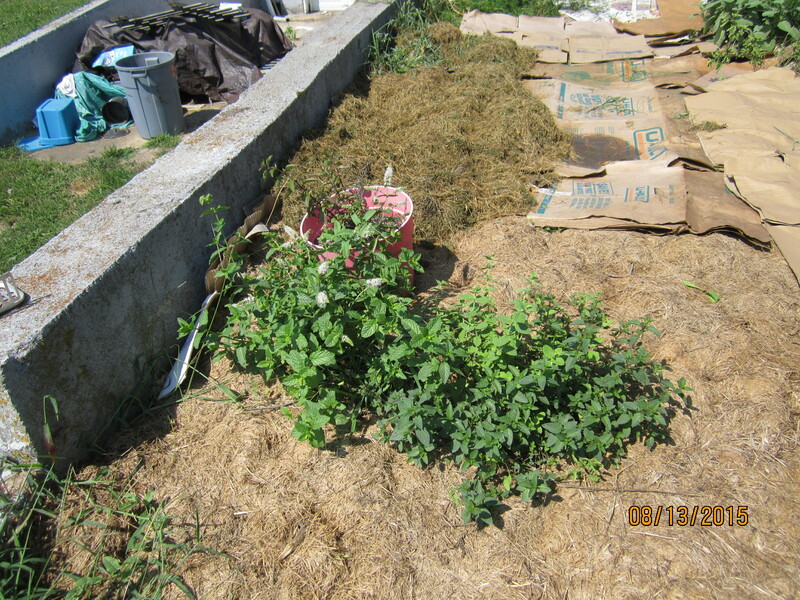 So far, most of the mulch has come from grass clippings, and it has been a slow process. This week, I was determined to get finished. 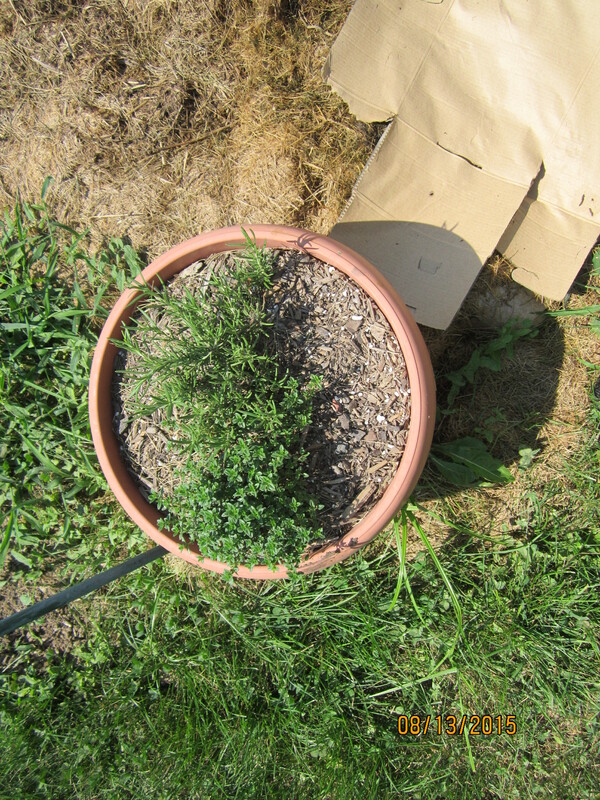 Technically, the herb garden isn’t much of one yet, although most of the transplants I put out there have done well. 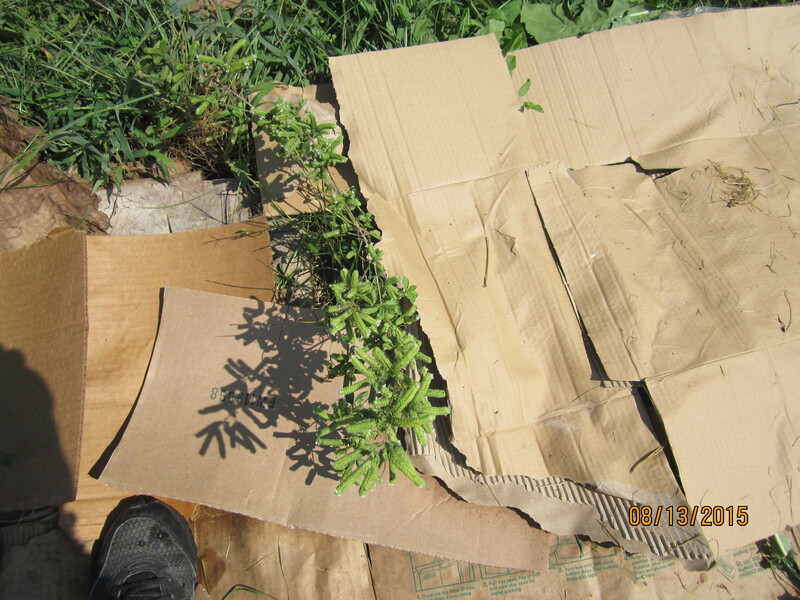 So, I was out there, pulling the bigger weeds, and covering the smaller ones with newspaper and cardboard, when I came across a vine with some interesting, feathery leaves. Then I noticed a few red blossoms. 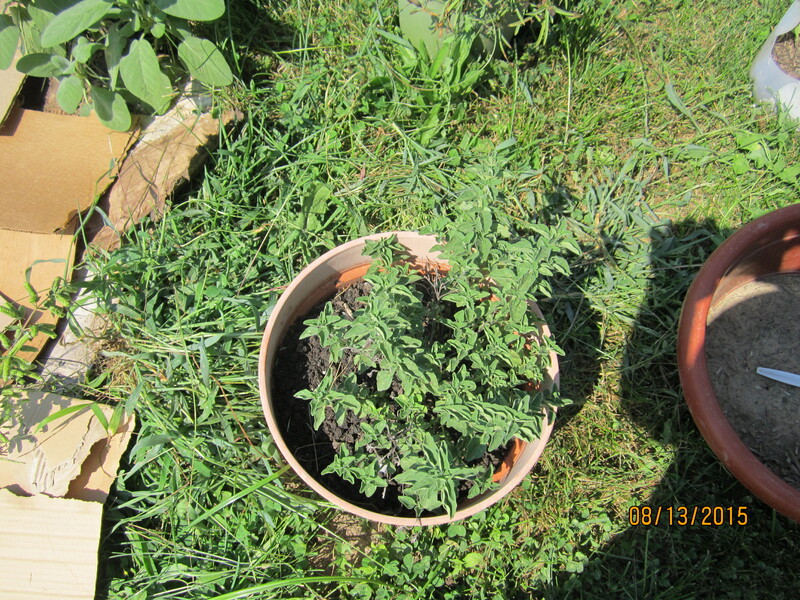 I headed in the house to see if Google could shed some light on my mystery plant. Success! 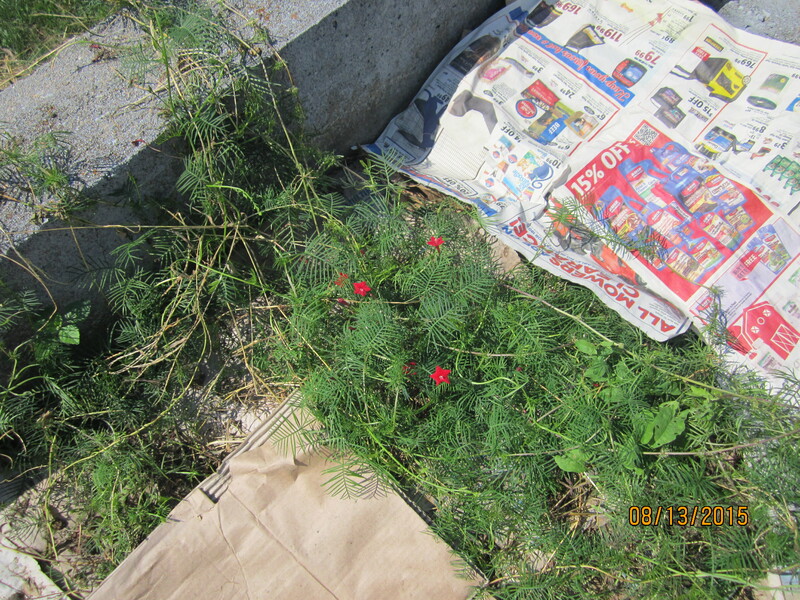 They are rose feather morning glories, and they are rare. Considering where I found them, I think a previous owner had to have planted them. So they can stay for now. I just mulched around them. Since Ed has decided that he can rake grass a lot faster than I can, he started helping with that last time he mowed. Yesterday, he determined that it was just going to take too long to get enough grass to finish the job. 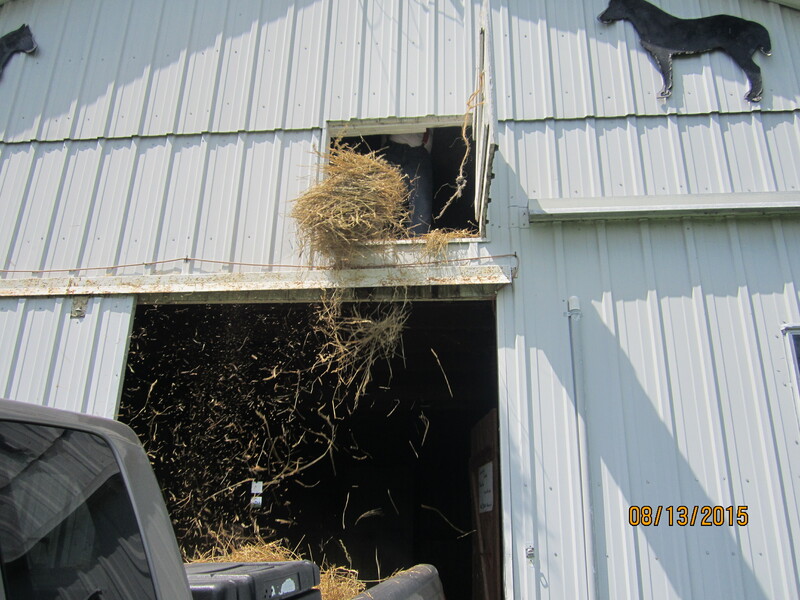 We have a ton of old hay in the barn. 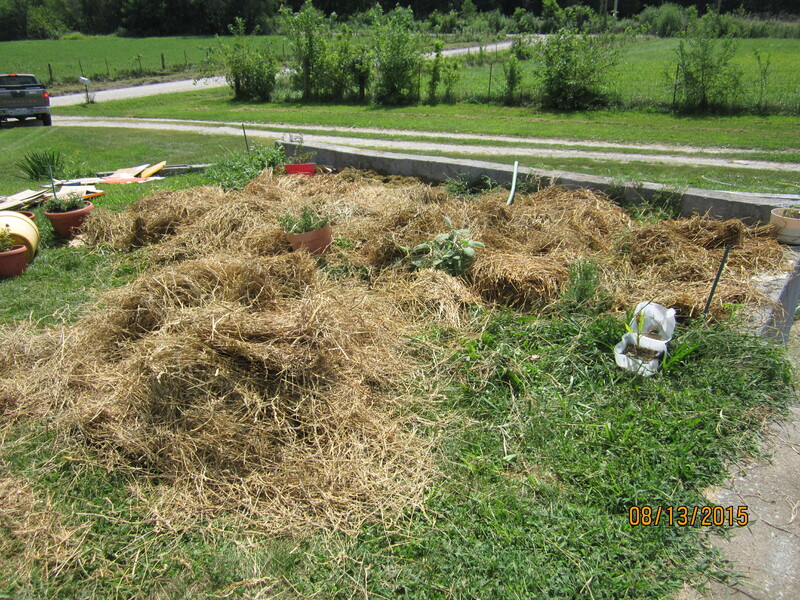 So, we went and filled the truck bed with hay and quickly finished the mulching. 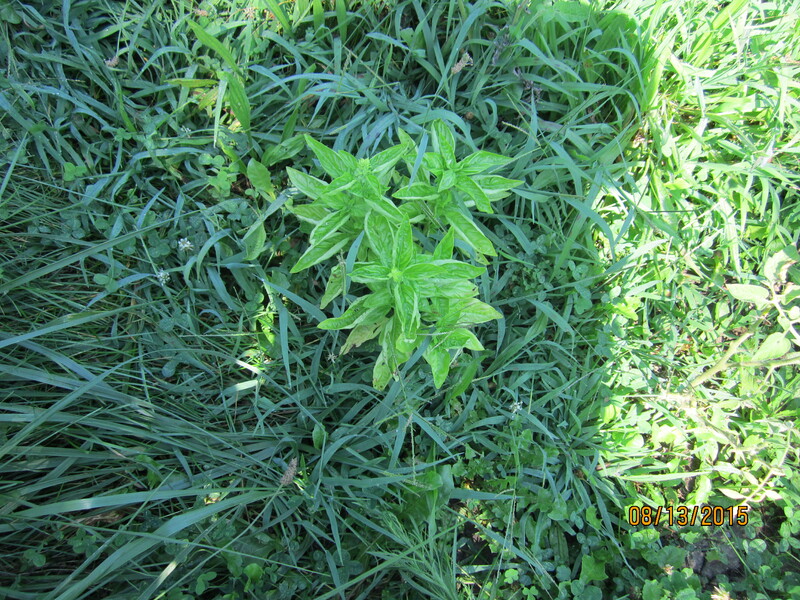 I just hope its dead enough to not try and give me new growth in my herb bed, next spring. As Ed said, Katherine has already named the chickens…much in the same way she names her drawings of dragons and My Little Pony characters. They are Free Fall, Sunrise, Noon, Dusk and Moonrise. Here is a pic I shared with our facebook friends. Today, she came inside, grabbed a pair of plastic gloves and headed around the corner toward her room (and the bathroom). She came back a few seconds later with a wet washcloth, holding up her gloved hand which now displayed a dark runny streak. 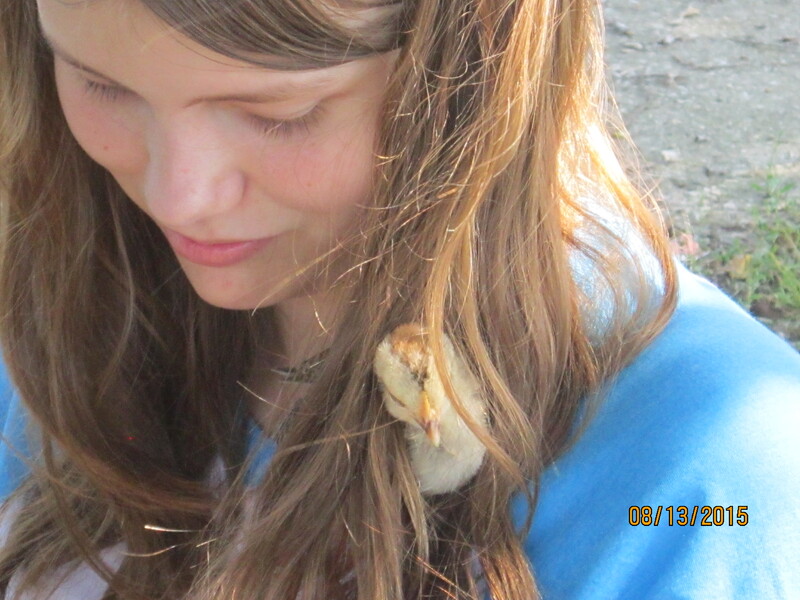 Yep, she had just been pooped on by one of her “babies”! As I struggled not to laugh, she did too. Then she begged me not to tell Ed, but he figured it out when he saw her wiping her hair down with the wash cloth. I have a feeling the chicken stories are just beginning!